After living in Germany for 2.5 years, we’ve starting ditching our wine bottles for fabulous beer! Okay, don’t fear, we still enjoy a nice bottle of wine, but stay tuned for a full review of the Dirt Farm Brewery! 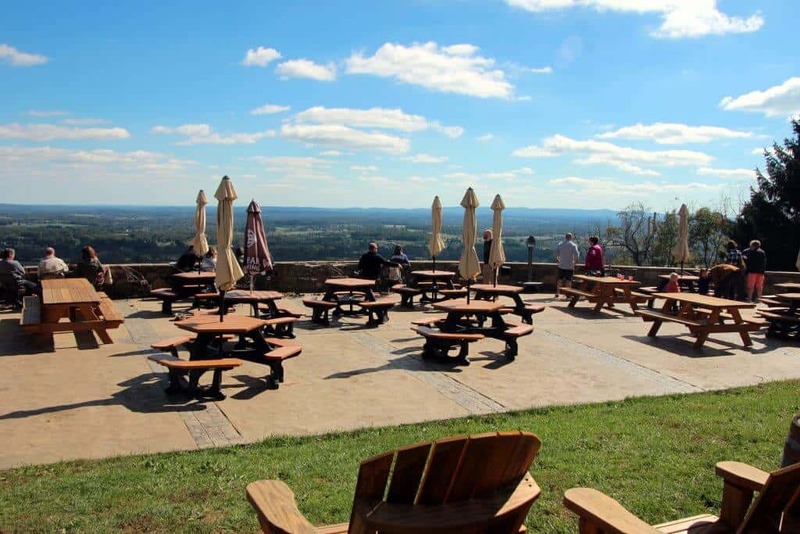 It’s family friendly, has beautiful views, a great menu, and tasty beer. 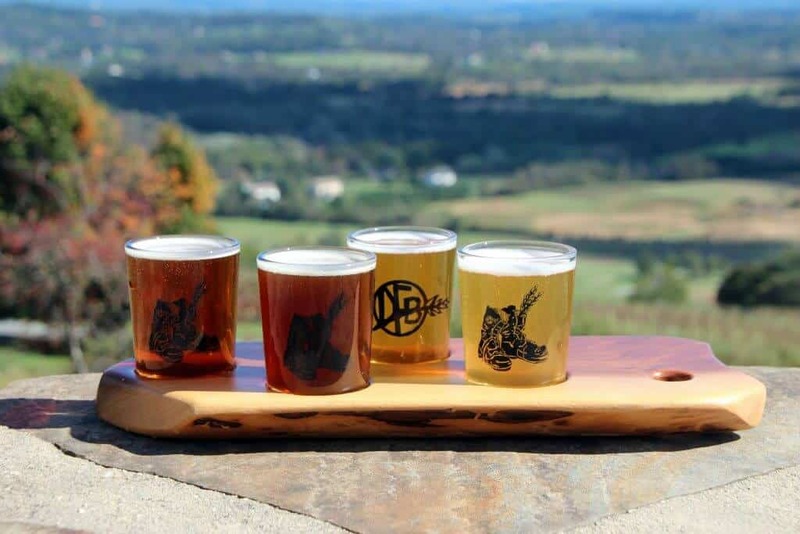 We actually happened upon Dirt Farm Brewing on our way to Great Country Farms. 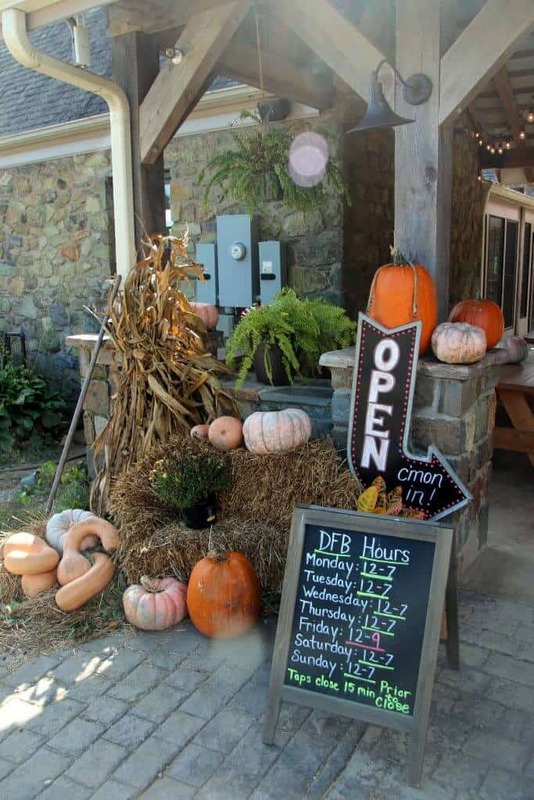 If you are visiting in the Fall, check out their amazing Fall Pumpkin Festival (<—- click the link to read all about it). 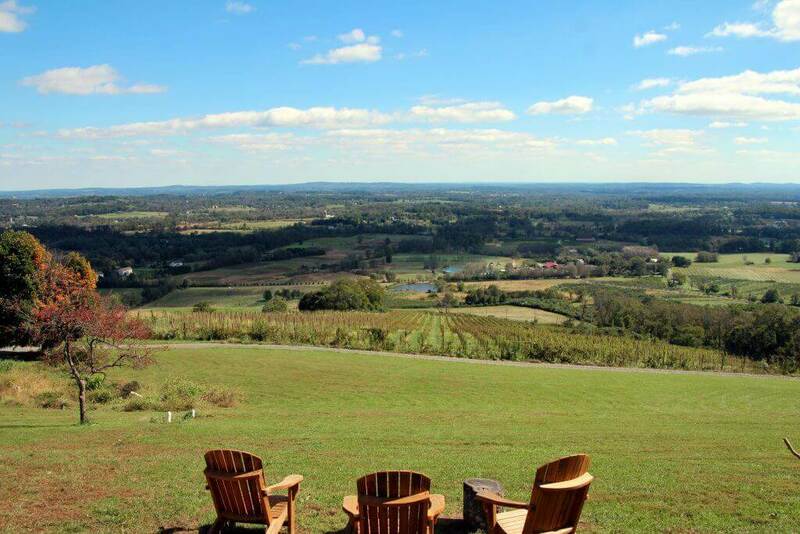 It is located in the beautiful Blue Ridge Mountains in a town called Bluemont and not far from the DC area (about an hours drive). You’ll find ample parking at the top of a long hill. Hooray for my Subaru and it’s hill assist. It might be a little sketchy in the winter, so keep an eye on the weather for those of you visiting later or earlier in the year. The hill isn’t bus friendly or limo friendly, so heads up for larger groups. I am a bit of a sucker for the history of unique places, so I cozied up with the bartenders to find out the story behind Dirt Farm Brewery. It was actually a hunting lodge built in 1941. You can see the original stone building. Then when the owner of the lodge passed away, one of the family members decided to move up to the lodge and make it their family home. Children grew up running around the beautiful hills and exploring the woods just behind the house. 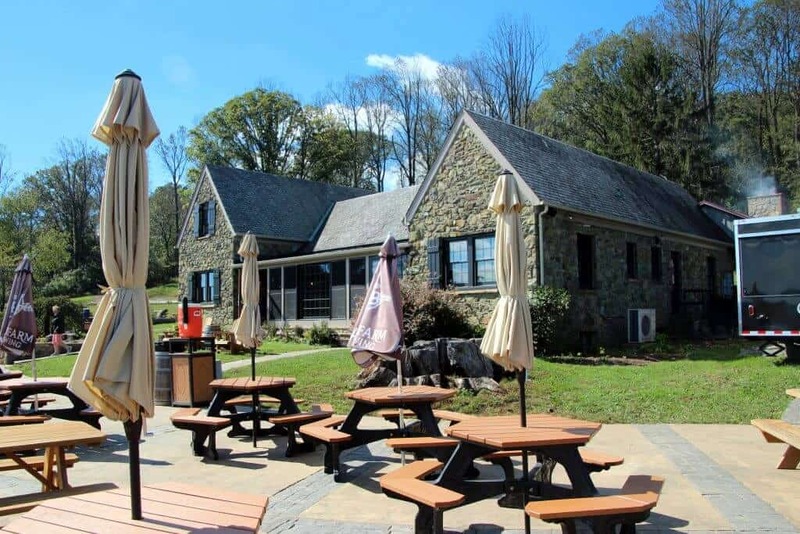 The house was put up for sale and purchased by the current owners who run Dirt Farm Brewing in May 2015. Fun fact: One of the girls that grew up in the home actually works as a bartender! She said she is usually nervous for her first day, but it was just like coming home for her. My husband decided to do a sampler with four beers (Flight of Four). His four beers included: Farm Use, Staw, Red Merl, and Scott. His favorite of the bunch was the Red Merl (Irish Red Ale), which happens to be their award-winning beer! 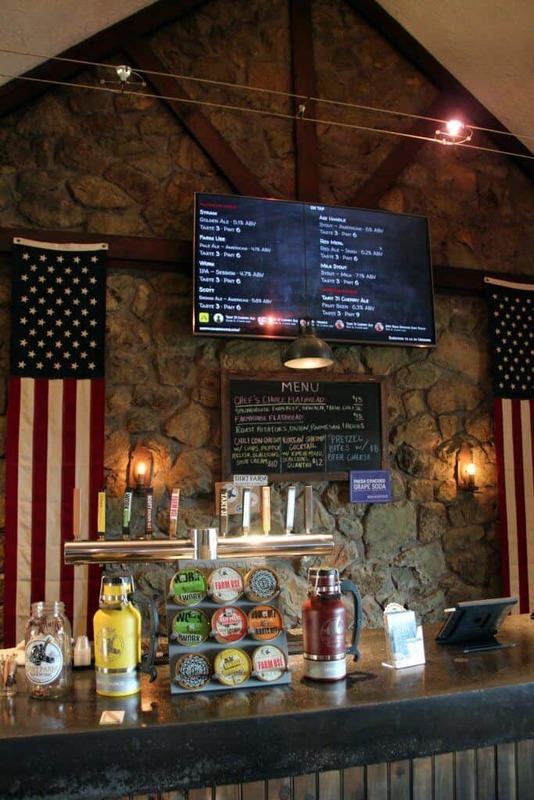 They have eight beers that rotate on tap, so come for a few visits to try them all! 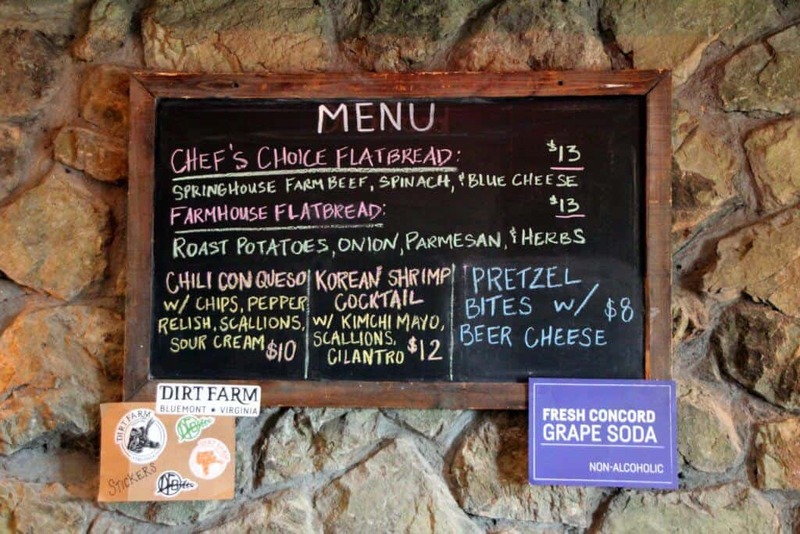 Dirt Farm Brewery does not allow outside food, so grab some of their delicious flatbreads or sample the pretzel bites (Yum!) They also have grab and go meat/cheese platters. 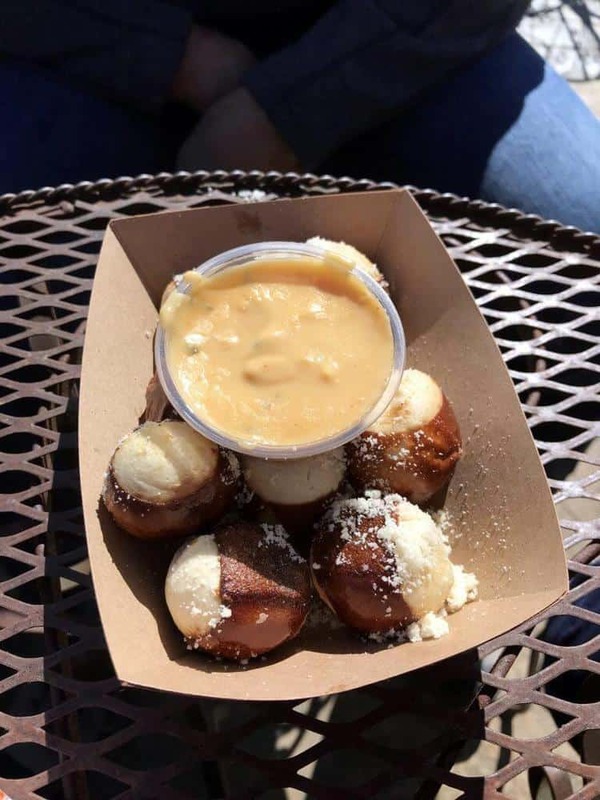 We decided to sample their pretzel bites along with beer cheese. After living in Germany, we have high expectations for pretzels and we thought the pretzel bites are full of flavor, soft and best dipped in the delicious beer cheese. My son and I aren’t beer drinkers, so we tried their concord grape soda….let’s just say one cup wasn’t enough! 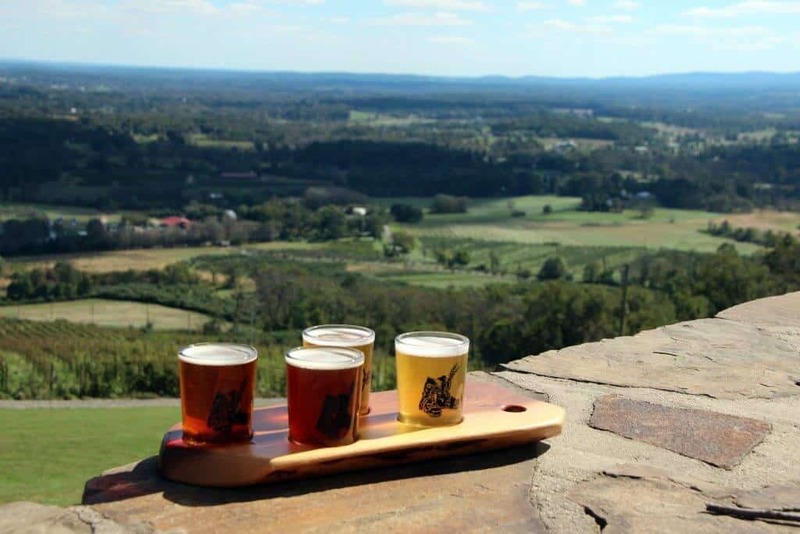 This is one of the best parts about Dirt Farm Brewery, the views! Find a place outside on the patio to enjoy your beer and snacks. The views are stunning (especially on a clear Fall day). The Brewery is child and dog-friendly (no dogs inside), perfect for the whole family. Alternatively, there is a great grassy area on the side (away from the entrance). 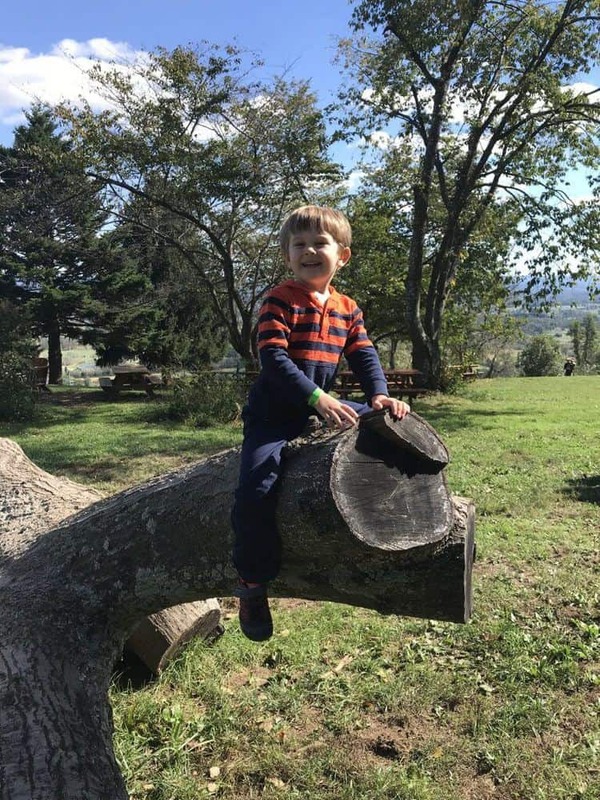 You’ll find logs for the kids to climb on and explore. There are plenty of Adirondack chairs or bring a picnic blanket to spread out. 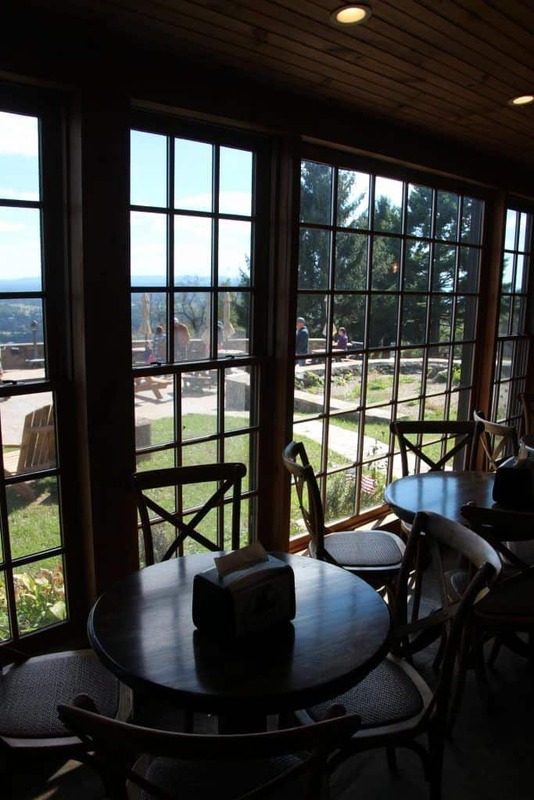 If it is a busy weekend, keep exploring the property because there is seating hidden around every nook and corner. 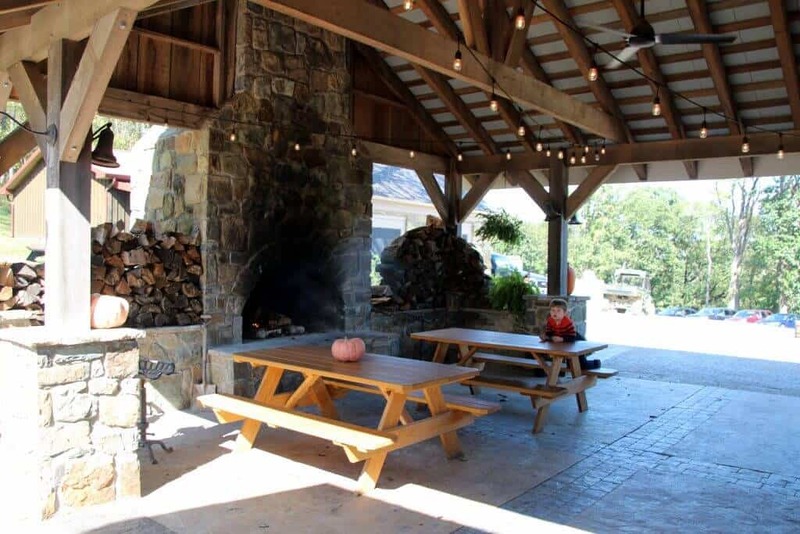 As you arrive, there is a beautiful fireplace with picnic tables to keep warm on a cool day. If it is really cold, find a table inside. 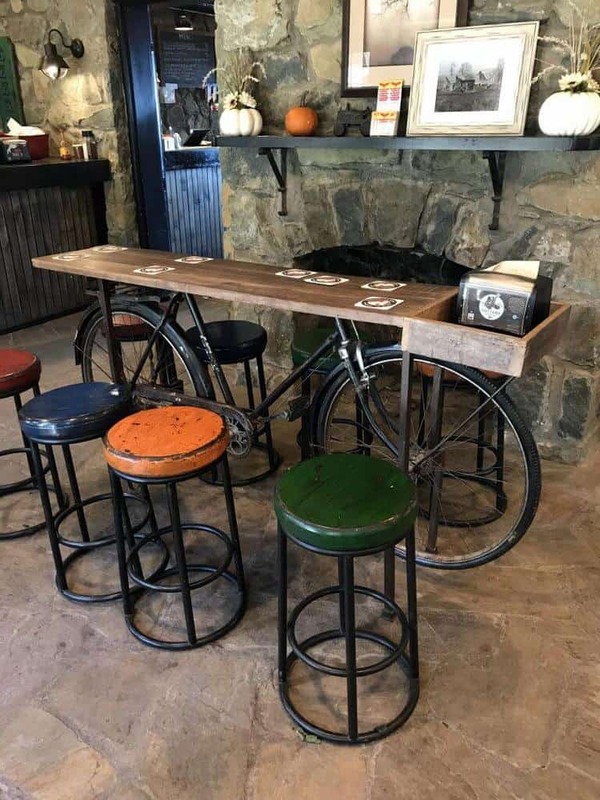 We thought this bike bar height table was pretty cool. 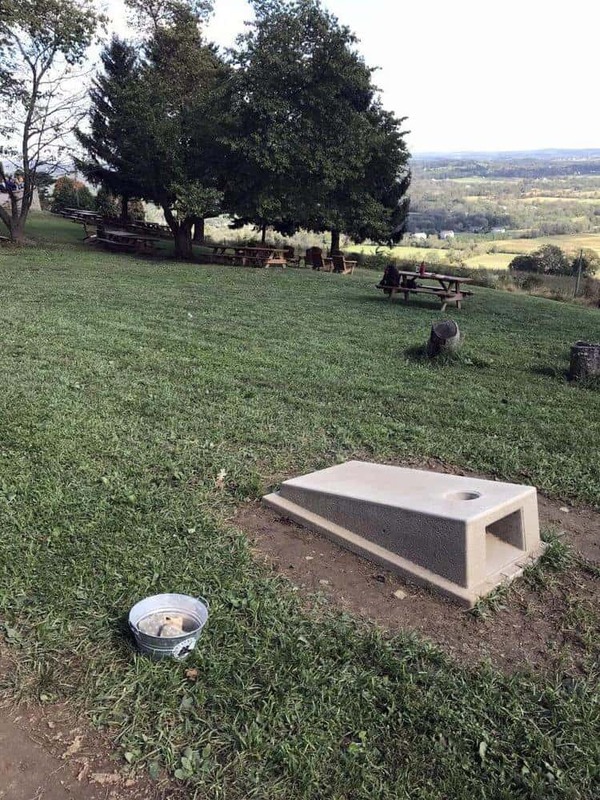 After eating our snacks and my husband enjoying his four beers, we packed up and headed over to the grassy field to play some corn hole. You can borrow the bean bags from the staff at the bar(bring an ID to leave at the bar). We played corn hole late into the afternoon. Feel free to bring along some games to enjoy the grassy area. I wouldn’t suggest balls because the slope is steep and your kids will spend more time retrieving them from the bushes. Check out their website to see all they have to offer. 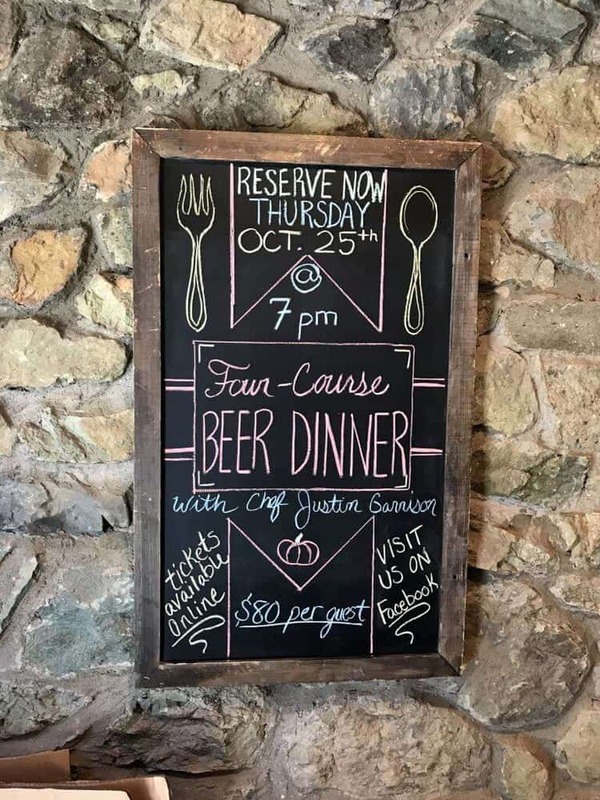 The taproom dinner looked like a great date night option. 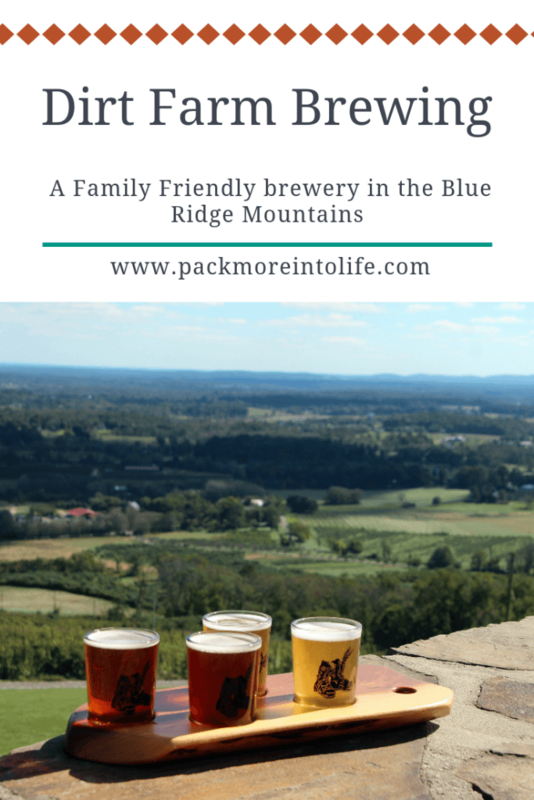 We were pleasantly surprised by the brewery and what it has to offer. We have been spoiled by the child-friendly places in Europe, so it was nice to see a child-friendly brewery that had a great mix of beers, food and play areas. 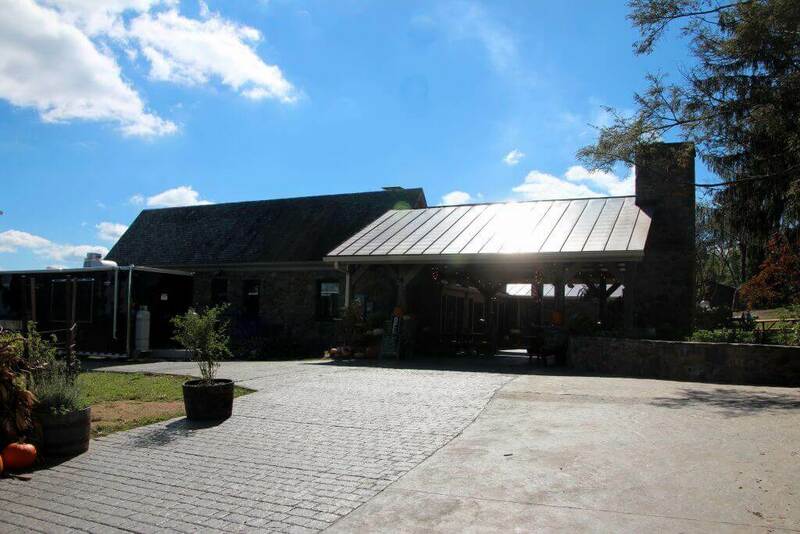 It also pairs really well with Great Country Farms, which is right next door. Did you enjoy reading this post? Want to see what other fun family-friendly events we’ve blogged about? Head over to our DC/VA page to see them all. Or perhaps you want to see where else we’ve traveled all around the world? Then head over to our destinations page to see them all.